Please note that the ebook versions of Broken and Scorned are 0.99! 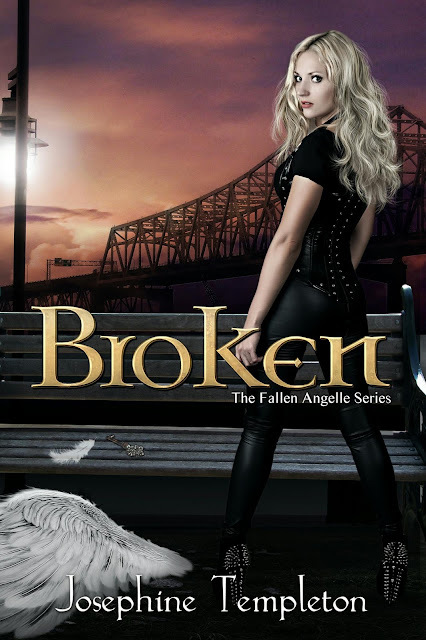 Broken, Book 2 of the Fallen Angelle series is now available for ordering at the links below. If you'd like a signed copy, please send me aprivate email. Angelle tossed in her fallen angel wings many molted feathers ago, but a shade demon pops in to ruin her plans of getting back into Heaven. He lays a curse on her. In order to stay out of Hell, she must find a missing Celestial angel and the chit’s demon lover. As the case develops, Angelle begins to suspect the answer might involve herself and her own Sangre demon boyfriend, Jack. To complicate matters, her last flame from Hell shows up. Mel, who has a penchant for the 1920’s era, is determined to take over the Devil's Brigade. To do that, he needs the hearts of an angel and a demon who are in love. Coincidence? Or are Angelle and Jack the target of a maniac’s scheme to rule Hades? Additionally, sign up at my website to get the password to a free ghost story written by yours truly.